We're going through a heat wave. Water rationing has started in several places. The haze is also back. 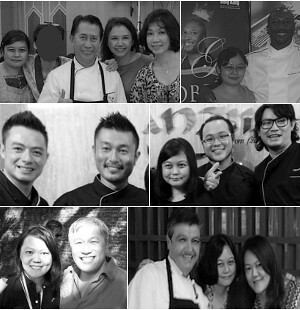 In the news! Haze hits KL, Selangor as heatwave continues to grip Malaysia: As Malaysia continues to be in the grip of the hottest weather it has ever experienced, parts of Selangor and Kuala Lumpur have now been hit by the haze. Things are looking pretty gloomy down here but as they say, 'life goes on!' ; it's better to stay focused on drinking more water and at the same time do our best not to waste any, than on moping around. In this household at least, there is always soup to look forward to. It's one way of staying hydrated and to me, it's pick-me-up food. You don't need a whole lot of ingredients to make a delicious pot of clear soup. 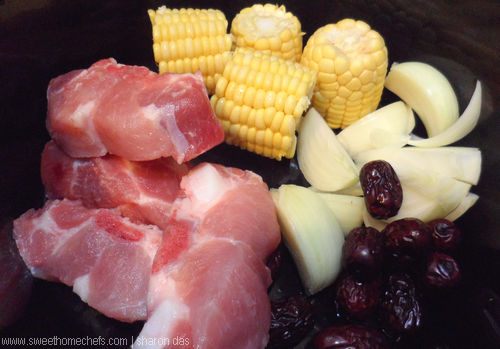 Sweet corn, red dates and onions is my favourite way of going about it along with either chicken or pork. With a slow-cooker, this is an effortless meal. I add a dash of soy and sliced chilli onto the meat, spoon it up with rice and be like, "Gosh, this is soooo satisfying.."
1) Place all the ingredients into the slow-cooker. Add water. Season with some salt and pepper. 2) Cook on high for 5 hours. Taste (the soup should be sweetish at this point). Season with more salt (optional) to get a savory flavour. 3) Serve garnished with spring onions. Place all the ingredients into the slow-cooker. Add water, season and voila! Best eaten on its own or with plain white rice. Gosh, my kind of soup. Perhaps I will try with chicken. Yum with a plate of rice. Mine too. I am always for real and simple food even if I get carried away sometimes. This is very easy and delicious recipe.. This is making me hungry, Sharon! What a lovely combination for soup! Thanks, Kanak. It's a regular on our table. Too easy, and I would say nutritious, to make. 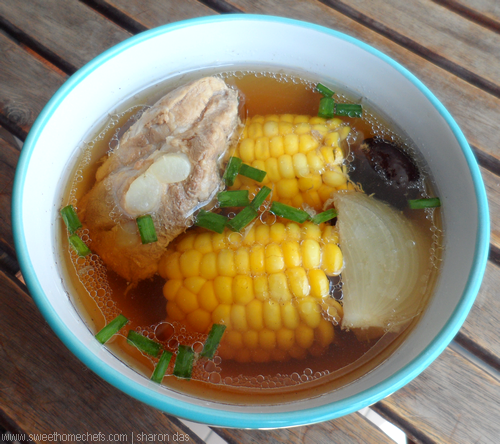 I often made such tasty soup with slow cooker as 1 pot meal ... great with steamed rice ^-^! Oh Sharon, this soup sounds and looks delicious and so easy to make...yes, I need to start using my slow cooker...thanks for the recipe. 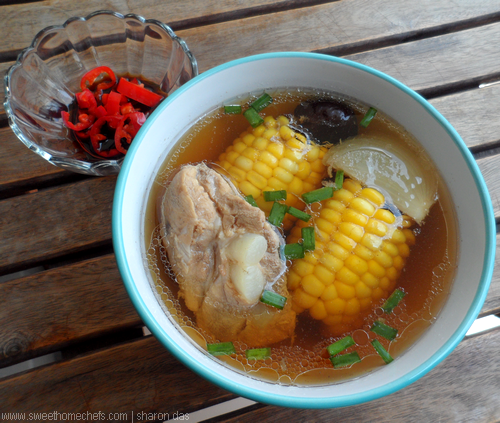 Love this kind of soup..delicious and very appetizing! I'm glad you do, Angie. It's a favourite of ours! Love this soup... So nourishing and comforting! Hi Sharon, this looks so nourishing and delicious! I hope the haze situation gets better soon! Thank you, Jasline. I can't wait to see blue skies and breathe fresh air again!